A windows application which can offer the best performance available to convert PostScript to Image, such as bmp, tiff, jpeg, gif, png, pcx, emf, wmf, and so on. PS to Image is a windows application which can offer the best performance available to provide speedy conversions from PostScript to Image, such as bmp, tiff, jpeg, gif, png, pcx, emf, wmf, and so on. Ps to Image creates the images that are perfect representations of the original print files. All PS fonts, forms and other resources are reproduced exactly as they are on PostScript printers. It is easy to use and it is not based on print method. Otherwise, it does not need any third part software support. During the conversion, PS to Image optimizes images for archiving, retrieval and display, it can eliminate the need for costly changes to the native print applications. 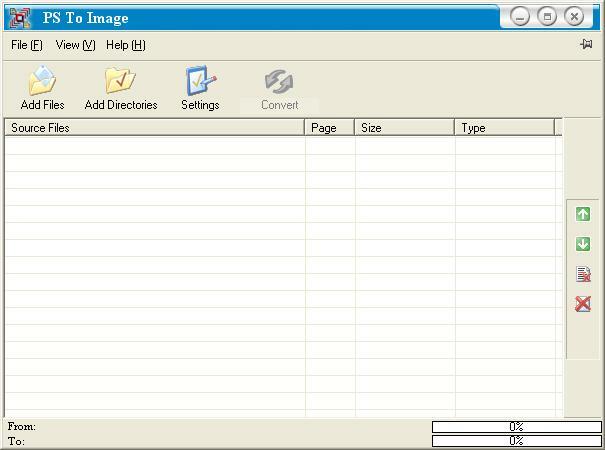 It quickly convert ps/eps document to image format. It supports batch ps/eps to image conversion. It supports multifarious image format,such as 'bmp', 'tiff', 'jpg', 'gif', 'png', 'pcx', 'emf', 'wmf' etc. It supports conversion into 1bit, 4bits, 8bits,4bits grayscale ,8bits grayscale and 24bits format image. It supports multifarious compression of tiff image,such as lzw, jpeg, packbits, ccitt group3, ccitt group4, rle etc. Support multilateral language, such as English, French, German, Italian, Chinese Simplified, Chinese Traditional, Czech, Danish, Dutch, Japanese, Korean, Norwegian, Polish, Portuguese, Russian, Spanish, Swedish, Thai, etc. PS to Image can quickly convert ps/eps document to image format, such as bmp, tiff, jpeg, gif, png, pcx, emf, wmf, and so on. It is easy to use and it is not based on print method.